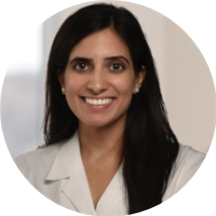 Dr. Akta S. Kakodkar completed her residency training at the University of Illinois at Chicago working in world famous institutions including Lurie Children's Hospital and Cook County Hospital of Chicago. She attended an accelerated 6 year BA/MD program in Kansas City, MO prior to beginning her residency in Ear, Nose and Throat (ENT). She is devoted to providing compassionate and state of the art care for treatment of all ENT disorders. Her philosophy is to treat you as she would her own family. Dr. Kakodkar is trained to utilize the most advanced medical and surgical techniques to diagnose and treat all Adult and Pediatric ENT disorders. The office was clean & welcoming & the coffee station is awesome. Mary & Kiara are not only well versed at their jobs, they are truly nice people. Dr. Akta explained everything thoroughly and I would recommend her highly. I met 3 truly wonderful people today. Everyone needs a raise! Dr. Akta Kakodkar, MD has no appointments on Zocdoc right now.